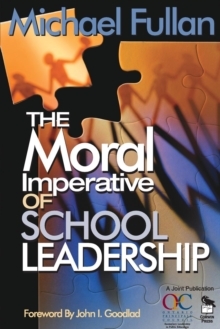 `The Moral Imperative of School Leadership is an important read for school leader and system administrators, not so much because it provides a prescription of the future of public education, but more because it elevates the moral imperative of public schooling and enshrine s the view that effective school leadership must be drive from a deep moral purpose' - Journal of Educational Administration`The Moral Imperative of School Leadership is sequel to what many heads consider Michael Fullan's best and most practical book, Leading in a Culture of Change. Here he follows up moral purpose, brought into sharp relief in individual schools. Without moral purpose, nothing of value is achieved. We learn how it is developed effectively and Michael Fullan makes the difficult but important case that truly moral school leadership recognizes its obligation to the wider community and other schools, an argument that those of us pushing for collegiates will welcome' - Tim Brighouse, Times Educational Supplement`The Moral Imperative of School Leadership is another slim volume in a series of such texts by this powerful figure and, after a series of understandably laudatory statements by colleagues and admirers, actually commences by reflecting back on his previous text What's Worth Fighting For in the Principalship (1997). As one has come to expect from this eminent writer this is a highly readable, well structured and accessible text that is above all positive. Indeed I have no doubt that many will find the work inspirational' - Mark Brundett, School Leadership and ManagementThe author examines the moral purpose of school leadership and its critical role in `changing the context' in which the role is embedded. In this bold step forward, Michael Fullan calls for principals to become agents as well as beneficiaries of the processes of school change. Concepts explored in depth include:} why `changing the context' should be the main agenda for the principalship} why barriers to the principalship exist} why the principal should be seen as the Chief Operating Officer of a school} why the role of the principal should figure more prominently within the system.